In Getting Started With the Neo4j Graph Database – Linking Neo4j and Jupyter SciPy Docker Containers Using Docker Compose I posted a recipe demonstrating how to link a Jupyter notebook container with a neo4j container to provide a quick way to get up an running with neo4j from a Python environment. If you’re using Kitematic (available via the Docker Toolbox), launch the docker command line interface (Docker CLI), cd into the directory containing the docker-compose.yml file, and run the docker-compose up -d command. This will download the necessary images and fire up the linked containers: one running neo4j, one running RStudio, and one running a Jupyter notebook with an R kernel. Notebooks and RStudio project files are shared into subdirectories of the current directory (from which the docker compose command was run) on host. Sometimes, however, you know – or remember – how to do one thing in one language that you’re not sure how to do in another. Or you find a library that is just right for the task hand but it’s in the other language to the one in which you’re working, and routing the data out and back again can be a pain. Whilst python has a range of plotting tools available for it, such as matplotlib, I haven’t found anything quite as a expressive as R’s ggplot2 (there is a python port of ggplot underway but it’s still early days and the syntax, as well as the functionality, is still far from complete as compared to the original [though not a far as it was given the recent update;-)] ). So how handy would it be to be able to throw a pandas data frame, for example, into an R data frame and then use ggplot to render a graphic? The Rpy and Rpy2 libraries support exactly that, allowing you to run R code within a python programme. 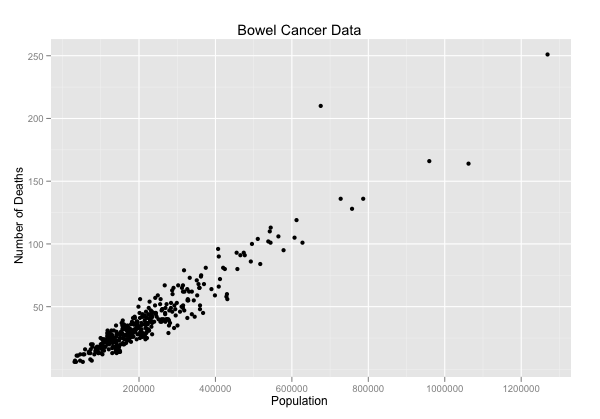 For an example, see this Example of using ggplot2 from IPython notebook. There also seems to be some magic help for running R in iPython notebooks and some experimental integrational work going on in pandas: pandas: rpy2 / R interface. 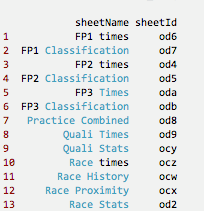 You can find a copy of the data I used to create the charts here: F1 2011 Year in Review spreadsheet. I’ve been using R-Studio to work with R, a) because it’s free and works cross-platform, b) it can be run as a service and accessed via the web (though I haven’t tried that yet; the hosted option still hasn’t appeared yet, either…), and c) it offers a structured environment for managing R projects. The lines come from a probabilistic model that helps us see the likely spread of death rates given a particular population size. If we want to do stats on the data, then we could, as Paul suggests, pull the data into a spreadsheet and then work from there… Or, we could pull it directly into R, at which point all manner of voodoo stats capabilities become available to us. The format is simple: readHTMLTable(url,which=TABLENUMBER) (TABLENUMBER is used to extract the N’th table in the page.) The header part labels the columns (the data pulled in from the HTML table itself contains all sorts of clutter). #What sort of datatype is in the Number column? Doing a bit of searching for the “funnel plot” chart type used to display the ata in Goldacre’s article, I came across a post on Cross Validated, the Stack Overflow/Statck Exchange site dedicated to statistics related Q&A: How to draw funnel plot using ggplot2 in R? 1) work out what values to use where! 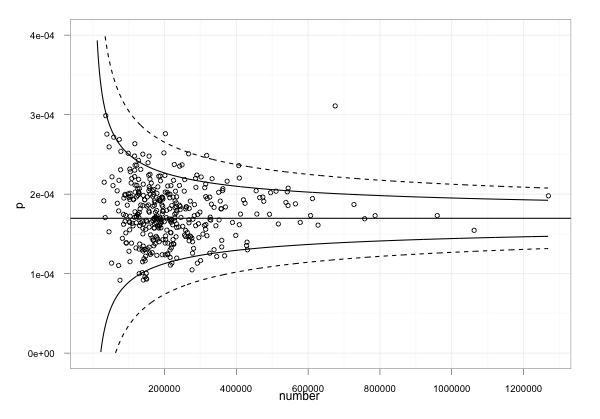 I did this by looking at the ggplot code to see what was plotted. 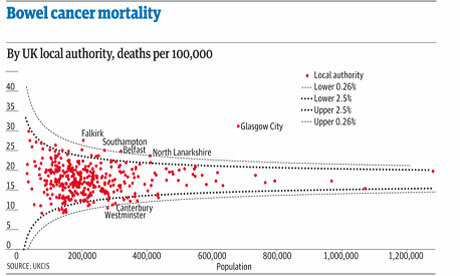 p was on the y-axis and should be used to present the death rate. The data provides this as a rate per 100,000, so we need to divide by 100, 000 to make it a rate in the range 0..1. The x-axis is the population. As I said above, it can be quite dangerous just pinching other folks’ stats code if you aren’t a statistician and don’t really know whether you have actually replicated someone else’s analysis or done something completely different… (this is a situation I often find myself in! ); which is why I think we need to encourage folk who release statistical reports to not only release their data, but also show their working, including the code they used to generate any summary tables or charts that appear in those reports. 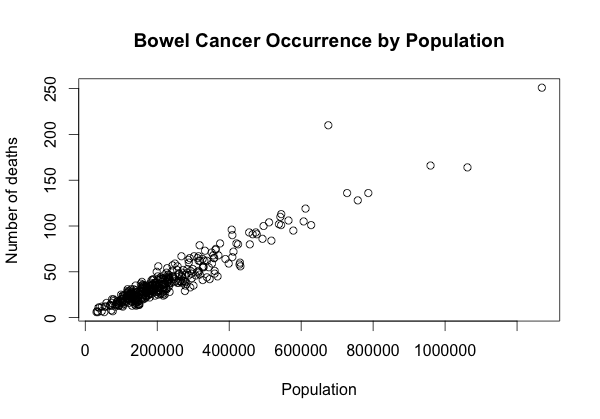 Given those caveats, what I hope to have done is raise awareness of what R can be used to do (including pulling data into a stats computing environment via an HTML table screenscrape) and also produced some sort of recipe we could take to a statistician to say: is this the sort of thing Ben Goldacre was talking about? And if not, why not? PS for how to generate reports that can (optionally) also self-document with actually source R code, see How might data journalists show their working? Sweave. The code used in, and comments added to, that post make further refinements to the funnel plot code. This should give you an XML output. To get the output as a JSON feed, append ?alt=json to the end of the URL. Having constructed the URL for sheets listing for a spreadsheet with a given key identifier, we can pull in and parse either the XML version, or the JSON version, into R and identify all the different sheets contained within the spreadsheet document as a whole. I couldn’t contain myself (other more pressing things to do, but…), so I just took a quick time out and a coffee to put together a quick and dirty R function that will let me run queries over Google spreadsheet data sources and essentially treat them as database tables (e.g. Using Google Spreadsheets as a Database with the Google Visualisation API Query Language). It requires the spreadsheet key value and a query; you can optionally provide a sheet number within the spreadsheet if the sheet you want to query is not the first one. In that example, and by default, we run the query against the first sheet in the spreadsheet. The real question is, of course, could it be useful.. (or even OUseful?!)? What that call does is run a query against the Guardian Datastore spreadsheet that lists all the other Guardian Datastore spreadsheets, and pulls out references to spreadsheets relating to “crime”. I spent a chunk of today trying to get my thoughts in order for a keynote presentation at next week’s The Difference that Makes a Difference conference. The theme of my talk will be on how visualisations can be used to discover structure and pattern in data, and as in many or my other recent talks I found the idea of Anscombe’s quartet once again providing a quick way in to the idea that sometimes the visual dimension can reveal a story that simple numerical analysis appears to deny. Quite by chance, I also happened upon a short exercise based on using R to calculate some statistical properties of the quartet (More useless statistics), so I thought I’d try and flail around in my unprincipled hack-it-and-see approach to learning R to see if I could do something similar with rather simpler primitives than described in that blog post. We can construct a simple data frame containing just the values of x1 and y1 with a construction of the form: data.frame(x=c(anscombe$x1),y=c(anscombe$y1)) (where we identify the columns explicitly by column name) or alternatively data.frame(x=c(anscombe),y=c(anscombe)) (where we refer to them by column index number). – to generate a data frame containing three columns and the data for group 1, followed by group 2, we would use a construction of the form: data.frame(xVal=c(anscombe$x1,anscombe$x2), yVal=c(anscombe$y1,anscombe$y2), mygroup=gl(2,nrow(anscombe))). 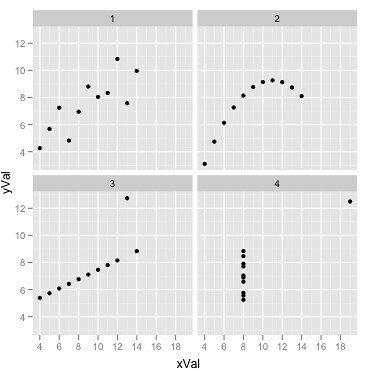 That is, populate the xVal column with rows from x1 in the anscombe dataset, then the rows from column x2; populate yVal with values from y1 then y2; and populate myGroup with 11 1’s followed by 11 2’s. This final command will give us a data frame with the 3 columns, as required, containing values from group 1, then group 2, then groups 3 and 4, all labelled appropriately. PPS And here’s something else for the data junkies – an easy way of getting data into R from Datamarket.com: How to access 100M time series in R in under 60 seconds.